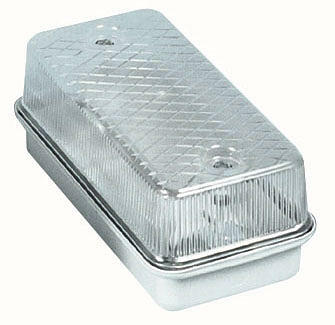 40 watt IP44 aluminium bricklight. The Franklite Boulevard Pedestal Lantern is an Italian Matt Black die-cast aluminium lantern with a vandal resistant polycarbonate lens. The Franklite Boulevard Post Lantern is an Italian Matt Black die-cast aluminium lantern with a vandal resistant polycarbonate lens. The Franklite Boulevard Single Lamppost is an Italian Matt Black die-cast aluminium lantern with a vandal resistant polycarbonate lens.. The Franklite Boulevard Triple Headed Lamppost is an Italian Matt Black die-cast aluminium lantern with vandal resistant polycarbonate lenses. The Firstlight Large Classic Bulkhead is made of die cast aluminium in a Black finish. The Firstlight Small Classic Bulkhead is made of die cast aluminium in a Black finish. The Elstead Firenze Pillar Lantern is manufactured from the finest materials in a Black finish. The Elstead Firenze Three Headed Lamppost is manufactured from the finest materials in a Black finish. The Elstead Firenze Wall Lantern is manufactured from the finest materials in a Black finish. The Firstlight Fusion Double Up & Down Wall Spotlight is in a Stainless Steel finish. The Elstead Glenbeigh Pedestal Lantern is in a Black finish with an opal globe diffuser and is part of the Coastal Collection. The Elstead Glenbeigh Pillar Lantern is in a Black finish with an opal globe diffuser and is part of the Coastal Collection. The Elstead Glenbeigh Post Lantern is in a Black finish with an opal globe diffuser and is part of the Coastal Collection. The Elstead Glenbeigh Suspended Wall Lantern is in a Black finish with an opal globe diffuser and is part of the Coastal Collection. The Elstead Glenbeigh Wall Lantern is in a Black finish with an opal globe diffuser and is part of the Coastal Collection. IP67 stainless steel hexagon walk-over fitting. IP67 stainless steel round walk-over fitting. IP67 stainless steel square walk-over fitting. The Firstlight Lars Exterior Wall Lantern is in a Black finish with a frosted glass diffuser. The Elstead Luna Medium Wall Light is a made from solid aluminium in a Satin Black finish. The Elstead Luna Medium Wall Light is a made from solid aluminium in a Titanium finish. The Elstead Luna Small Wall Light is a made from solid aluminium in a Satin Black finish. The Elstead Luna Small Wall Light is a made from solid aluminium in a Titanium finish. The Elstead Magnus Up and Down Exterior Wall Light is in a contemporary design and a dark grey finish. The Elstead Magnus Exterior Wall Light is in a contemporary design and Dark Grey finish. Luxury Lighting supply a large range of hotel outdoor lighting to suit all budgets and styles. Outdoor lighting ideas for hotels from exterior wall lights, lanterns, post lights, bollard lighting to bulkhead lights and much more. We supply hotel exterior lights in modern, contemporary and traditional designs and in various finishes.